My latest pickup arrived in the mail today. The 2012 Air Jordan VII Retro black/true red-dark charcoal-club purple. Still looking for a pair, click here to buy them on eBay. Released last Saturday, September 1st. These were another successful release from Jordan Brand as they did not take long to sell out. Shout out to FinishLine.com for helping me out once more. I had to add a pair of these to the collection. This time around, only one pair needed as I still have my 2002 pairs. 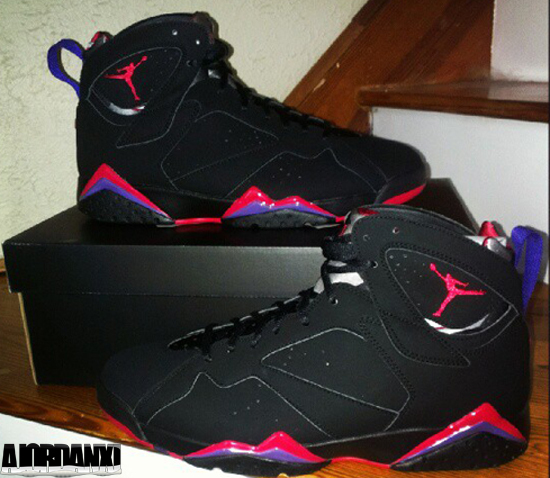 Look for them in the Air Jordan VII section of My Collection soon. If you're still looking for a pair, check out InstyleShoes.com or if your size is sold out, grab a pair from eBay here.